I like to make lists. (I could actually make a list explaining why lists are so awesome, but I'll refrain... for now.) In fact, I keep a few Disney specific lists in the Notes app on my iPhone. One of them is attractions I still haven't experienced (maybe I'll update you on those soon), and the other one I add to fairly often when I'm reading the Disney Food Blog is "Snacks To Try" at Walt Disney World. While I don't live and die by these lists while I'm in the Parks, I find it's nice to have them on hand when I'm trying to remember what it was I wanted to try and where it's located. Snack, Park, and Location all in one handy file! Notice I've listed what the snack is as well as where I can find it. Here's the trick, aside from World Showcase locations, I really still can't find most of these foods! Last trip I told Kyle I had absolutely no sense of direction. I don't think he believed me as much as he should have, but towards the end of the trip I proved it when I marched off toward some attraction in Hollywood Studios, and he had to herd me back in the opposite direction! So basically we'll be in the right Park (and hopefully I'll be able to eat this time), and I'll be able to pull out my iPhone & show Kyle what I'm hoping to find, and he'll take me there. In the last pre-trip report post about snacks I wrote about the White Chocolate Elephant Cupcake and the German Chocolate Cookie, so I'll let you go back to that post to check those out. 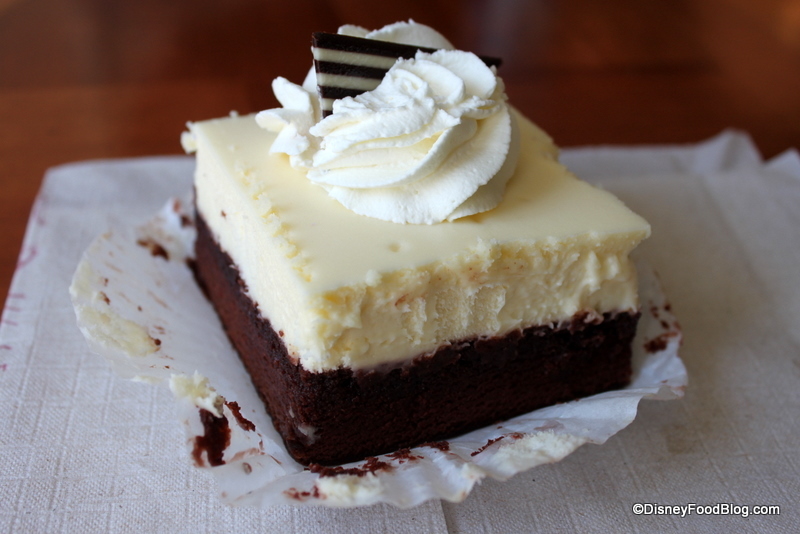 The Boardwalk Bakery has some amazing looking treats, and two of them are on my list. I'm doubting we'll head over there this trip, but one day I want to try their Cheesecake Brownie (cheesecake layered on top of a chocolate brownie - yum!). 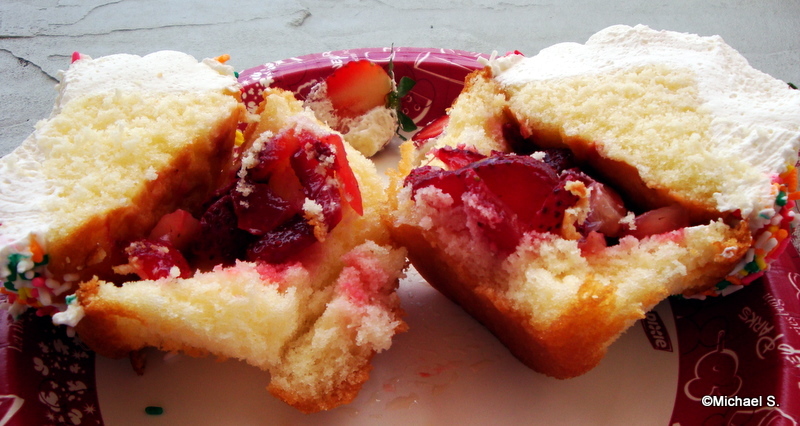 Oddly, while the Strawberry Shortcake Cupcake is on my list, as of tonight I have no desire to eat it. It's one of those types of desserts that look super yummy some days, and other days I'm just not interested in it. Below you can see a cross section. I love how they scoop out part of the cupcake, fill it, and then put the scooped out cake back on top before they ice it! I need to try to do this next time I make cupcakes. 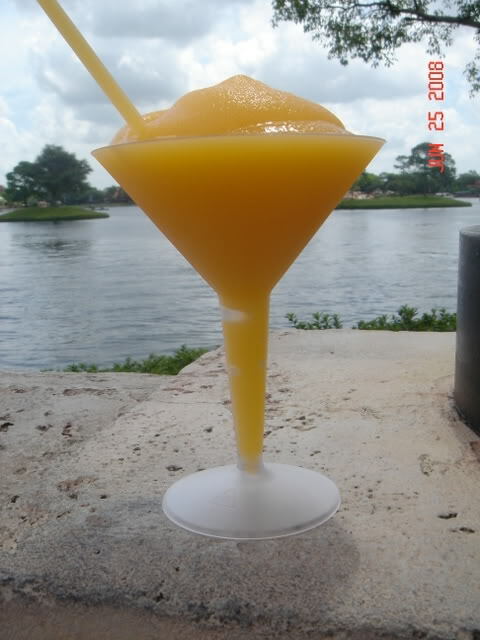 I don't usually put alcoholic beverages on my list of snacks, but Disney Food Blog wrote a report about the Marnier Orange Slush, and since I love frozen drinks, orange flavoring, and something that makes me slightly unpredictable, this looks like a must try! Don't laugh at me, but I have a major worry over this drink. Have I ever told you about the time that I pronounced omnipotent as om-knee-poe-tent in AP English or the time I was reading the last Harry Potter book aloud to my sister, and I kept coming across the phrase "the Goblin-Wizard liaison" but kept saying "lesion" instead of "liaison" until my brother-in-law finally looked over my shoulder and humorously called me out for being a moron? Yeah, I know big words, but I tend to have issues pronouncing them sometimes. See where this is going? I'm afraid to try to order this drink because I have no idea how to pronounce "Marnier". I keep hearing "mariner" like The Old Man and the Sea when I say it in my head. Someone please help me out! Someone on Twitter posted a picture of Germany's Apple Strudel, and my mouth has been watering ever since! I love love love apple desserts, and that's saying something because I tend to like my fruit separate from other stuff and in its regular just-off-the-tree/vine/bush form. 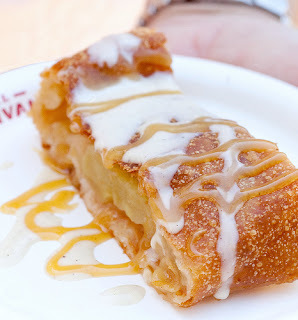 Sadly when I google'd this image, I discovered that it seems like the Apple Strudel is a special dessert from the Food and Wine Festival. Any of my Disney readers know if that's true? Before I wrap this post up, I thought it would be fun to include the snack that Kyle is looking forward to trying on this trip. When I mentioned the Apple Strudel, he agreed it looked good, but tonight he tweeted that he'd like to try the Raspberry Lemonade Slush at the Cheshire Cafe. 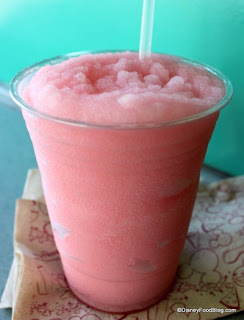 While I'm a huge fan of frozen beverages, I'm not crazy about raspberry, so I might snag a cookie on Main Street when we head over to find this drink in Magic Kingdom. Granted, I'm not really sure where this cafe is... sounds like it's near the Teacups attraction. I *just* got this tweet from Kyle, and it made me smile, so I had to add it to this blog post. Ever have one of those moments where you really want a specific Disney snack like right now? Hehe! Me too! But have you seen those things?! They're huge! As usual, I hope to get some Napoleon from the bakery in France as it's my favorite snack in quite possibly the entire world. :) How about you? When you head to Walt Disney World, what snacks do you always look forward to getting? Is there a snack you're dying to try? Next Post: I'm waiting for a good hair day combined with one where I wear a cute outfit and do my makeup, so I can make a tutorial video to post the give-away that I've been wanting to do for 5 months! Should be up in the next week or so! Your list looks yummy.... if you like carrot cake you should check out the carrot cake cookie at the Writer's Shop in Hollywood Studios. It is located not too far from Star Tours and the Sci-Fi Diner. 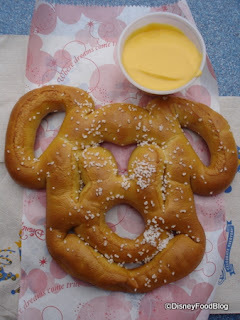 I posted a picture on my Disney blog.... you have to check out the picture, its huge and super yummy!! !